Verdict: 4.3 / 5If, then, you're in the market for a good pair of headphones and you'd have to choose between the two, my advice would be to opt for the Xqisit unit, especially if you don't already have an Apple smartphone. Since Dr Dre launched his Beats audio devices in 2006, many fans and sometimes experts would bet their life’s savings arguing in its favour. With great features and excellent audio quality, there weren’t many manufacturers that could compete with their wireless range of headphones for consumers. That said, in recent years, as wireless technologies become more ubiquitous and more affordable, there has been quite a number of rising competitors to the throne. The latest in the line of would-be usurpers is the Xqisit ANC Wireless Headphones oE400. Xqisit recently launched a range of new products on the shores of South Africa, but the German company has been manufacturing audio devices since 2009 in Cologne. While the headphones may look fairly unassuming, they have a lot to offer any user, but does it do enough to shake things up at the top? From the moment of unboxing, the headphones were striking in appearance. Despite its predominately plastic build, the matte black finish provides a premium look and feel. There are a few touches of aluminium, which are hidden in joints and hinges of the headband. The headband itself is made of a faux leather material and cushioning foam, which provides adequate comfort for long hours of playback. The material build of the unit also makes it very lightweight, adding to the comfort during use. …the headphones were striking in appearance. There are a few buttons on the earcups. The right earcup houses the power on/off button, along with the skip backwards and forwards buttons, which also doubles as the volume controls. The right side also sports the micro USB port for charging. The left earcup is a bit more minimal, with only the noise-cancellation toggle and 3.5mm aux jack. 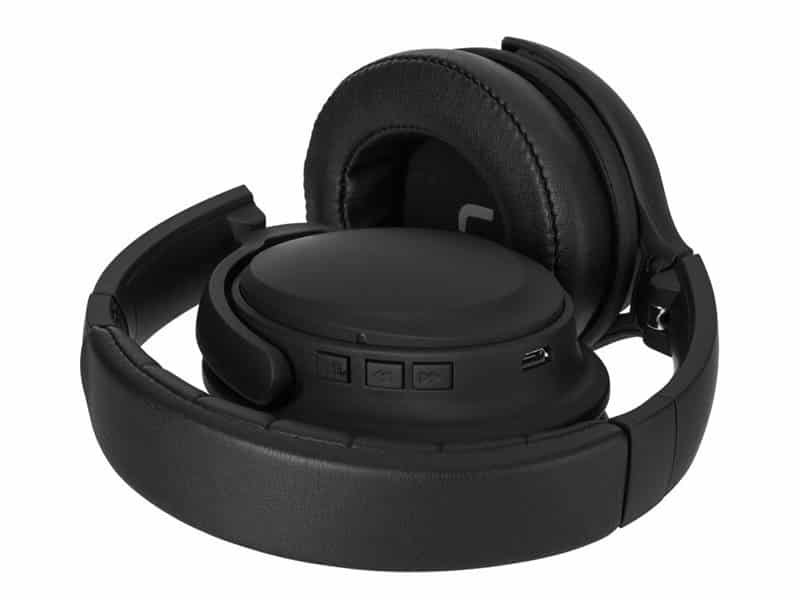 As for the earcups themselves, the faux leather is continued along with the soft foam cushioning. The oversized cups are extremely comfortable and are designed in such a way that creates a sort of suction over the ears, which allows for passive noise cancellation. There are still a few sounds that are audible, such as phone rings, loud laughing, etc. but does more than enough to block out any ordinary murmurs. There are a few extras in the contents, which includes a micro USB to USB cable to charge the unit, as well as a dual-auxiliary adapter, a 3.5mm audio cable, and carry case. The unit folds away fairly swiftly and can be transported with ease. In terms of specifications, the drivers have a frequency range between 20 and 20,000Hz, and an impedance of 32 ohms. The unit also has a 550mAh LiPo rechargeable battery, Bluetooth 4.0 with a range of 10m, active noise-cancelling of 25dB reduction, and integrated microphone. 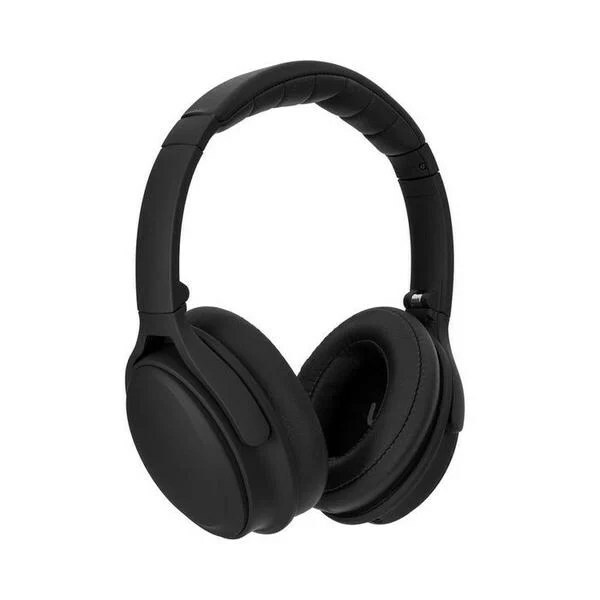 Starting with the active noise-cancellation, it is triggered by means of a simple switch and adds further performance to the passive noise-cancellation. The technology does a great job at blocking most ambient sounds out while listening to your favourite tracks. Short of a crying baby or giant speakers within a metre or two of your location, you won’t be hearing much, if any sounds while the active noise-cancellation is activated. In terms of battery life, the oE400 has audio playback with active noise-cancellation enabled for roughly 12 hours and 15 hours of talk time when using the microphone. In addition to this, the unit has a quick charging time, which takes less than an hour to fully recharge, even when using the USB port from your laptop or PC. This makes it a great travel companion. Xqisit has built themselves a reputation for producing great, German-engineered audio devices over the years, which is clearly audible with the oE400. Even without any adjustment on your PC, laptop or smartphone you’ve paired the unit with, it provides a good range of audio throughout the different frequencies, and can easily handle any genre thrown at it, from the fine-tuning of classical to deep bass of hip-hop. Having made a few minor adjustments, I was able to find the perfect balance of bass and high frequencies to provide great audio playback, where I could spend hours drowning away any surrounding sounds from the office, often times to the annoyance of my colleagues who had to resort to tossing pieces of paper to gain my attention. The sounds are crisp and clear from the very low to very high volumes and don’t distort at all when reaching higher volumes. 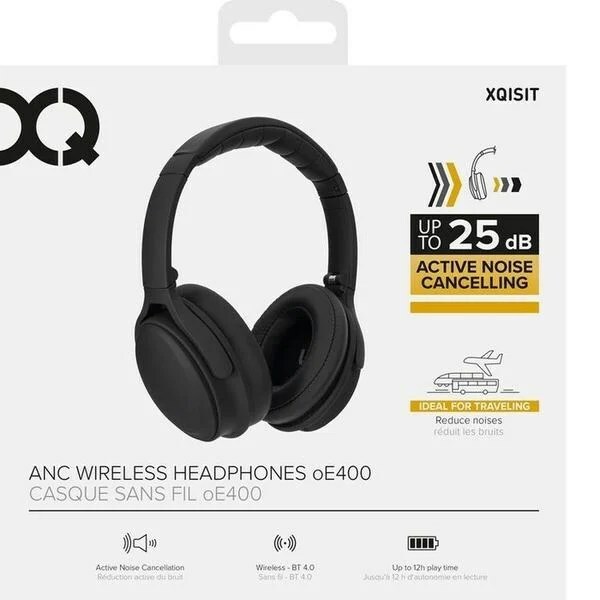 The Xqisit ANC Wireless Headphones oE400 provides great performances across the entire range of features. At a cost of just R2,000, they are more affordable than most headphones in the same category, almost half that of Apple’s Beats headphones. But, and the reason most of you are reading this, are they better or a suitable replacement for the Beats Solo 3 headphones? In terms of the feature set, Apple’s integrated wireless system allows for a few additional support functions that Bluetooth 4.0 is still catching up to. And in terms of overall audio quality, the Beats headphones just shaves it as well. The Beats Solo 3 also has a more premium finish, but I preferred that of the oE400, both in terms of comfort, thanks to additional cushioning, and minimalist look. I have these headphones and I am extremely happy with them. I use them at work and with just the active noise cancelling switched on they do a better job than my Peltor ear defenders. They are light and very soft so comfortable to wear all day. Sound quality is great and I have never had any problems with Bluetooth disconnecting or such. I would highly recommend them. I have this headphone put l have problems with Bluetooth disconnecting. I couldn’t connect it to my phone. Caveat emptor. I bought these about year ago, but after about three months the battery life dropped from 10-12 hours of listening to less than 30 minutes. Pretty disappointing experience an hour into a transatlantic flight. I also threw away the receipt, so there’s no way to have them replaced.